…or cookies. 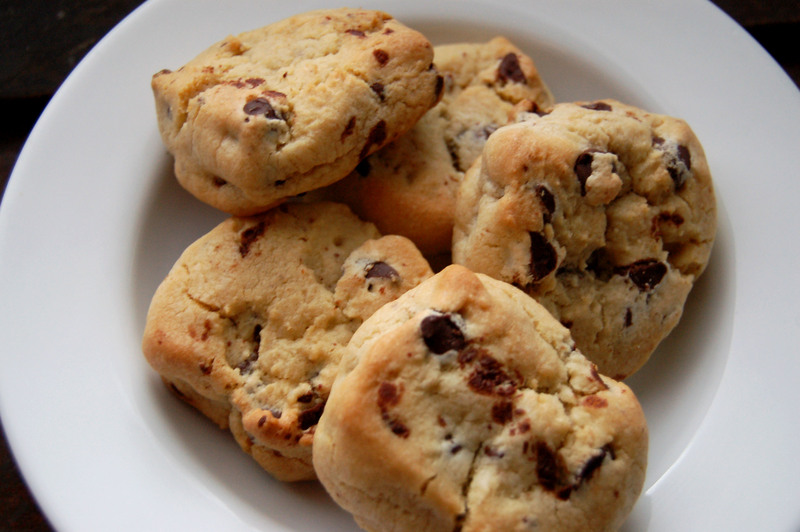 They’re technically cookies but they look like, and have the texture of, biscuits. Plus, if I call them biscuits then I can have one for breakfast with less guilt. 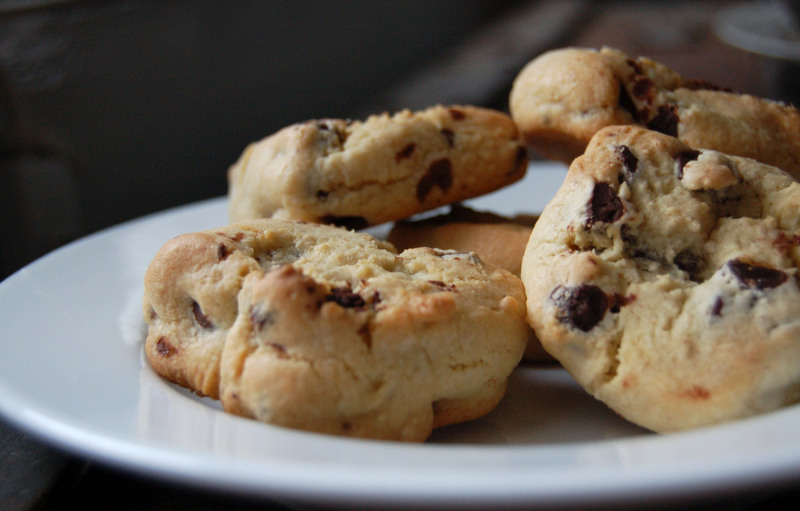 So yes, browned butter chocolate chip biscuits is what I’m officially calling them. Wait… browned butter? What exactly is that? Because I didn’t take photos while browning my butter I’ve found this great site that shows you exactly how. But making browned butter is fairly simple… you basically melt butter in a small sauce pan and continue it on a medium to low flame until it builds a froth on top. You’ll begin to see light browning spots in the froth and it will take on an earthy, nutty aroma. You have to watch it so it doesn’t burn… but the perfect browning happens right before it’s about to burn. The browner the butter, the better the flavor. Chill in the fridge until it becomes solid. You want it to be soft, but not melted. If it cools too hard, let it come back to room temperature before using. This will become your new secret ingredient that brings that “wow” factor to whatever you’re making. Preheat oven to 375 degrees and line a sheet pan (or two) with parchment paper. Beat the brown butter, sugar, and brown sugar on medium high speed with an electric mixer until light and creamy, about 4 minutes. Add the eggs one at a time, mixing after each. Add the vanilla. Add the flour, baking soda, and salt and mix until just combined on medium speed. Add the chocolate chips and mix until incorporated. The batter will be soft and fairly sticky. This is when I pull a large sheet of saran wrap out and put the dough in the center and roll it into a long tube-like shape, roughly 2″ in diameter. Twist the ends of the plastic wrap and put in the refrigerator for 30 minutes until it becomes more firm. Remove dough from the fridge and unwrap. Slice into 3/4″ dials, leave whole or divide in two for smaller biscuits. Place on baking sheet leaving 2 inches in between each biscuit. (I divided the dials in 2 with the biscuits pictured above and below). Bake until golden brown, 12-14 minutes. Cool on a wire rack. Of course, hot out of the oven is the best bite for any baked good and it’s the same for these. But please, let it cool enough so as not to burn your palate for good! Most people, including my roommate who jumped right into the kitchen as soon as these were done, prefer a cold glass of milk. But I’m a coffee and biscuit fan myself. But it’s all a personal preference when it comes to desserts. Heck, have a glass of Merlot with your browned butter chocolate chip biscuit if you want. This is America after all. Butter, browned or not, should be consumed in moderation. I would recommend not using butter substitutes, I mean, do we really know what’s in that stuff? But butter, real butter, tastes better and is a “real food”. But moderation is key, regardless of what Paula Deen says. Leslie – you could totally make these!